Tectonic plates – seismic shift – electoral tsunami…Have I used all the available metaphors/clichés for the south’s general election results? Oh right – I forgot the most important: ‘This marks the end of civil war politics’. It’ll no longer be Fine Gael (Free Staters) vs Fianna Fail (republicans). That’s because Fianna Fail has been cut, sliced and diced by the electorate; people are now concerned to elect politicians who will look after their jobs, their income, their pensions, and save them from the vice-like grip of the ECB. It’ll be right-wing vs left-wing politics from now on. And don’t say ‘But the Labour party will be in coalition with the Blueshirts – how can that be right-wing?’ or my cat may hear you and give himself a hernia. And especially don’t mention that the shrivelled remainder of Fianna Fail will be on the opposition benches alongside the left, opposing the government moves to implement plans originally drawn up by, um, Fianna Fail. It’s a bit like working on your right hook for some months and then punching yourself in the face. But while attention to one war may be finally petering out, attention to another remains as stubborn as ever. I was watching an episode of Madmen the other night – that’s the series about a Madison Avenue advertising company in the early 1960s – try to keep up, would you? 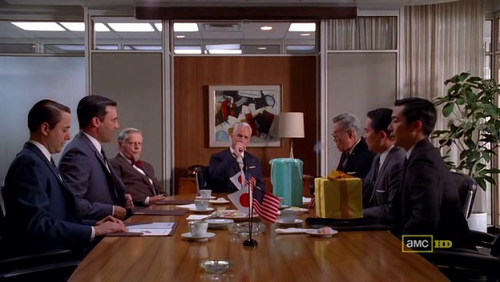 The plot in this episode centred on a Honda account being brought to the company by a group of Japanese businessmen. It’s a major acquisition, but then one of the advertising company goes all racist, who the hell are these little bowing buggers, who won the war anyway, I’ll never forgive them for what happened to my buddy on that destroyer in the Pacific, Hiroshima sure socked it to ’em, etc etc. The other advertising people try to shut him up, tell him it’s over, you hear, OVER, the war is FINISHED, we’re working with these people now, act civilized for God’s sake. Etc, etc. No good. The racist one is locked in the past, some fifteen years earlier. Similarly there are those who just can’t let go of the conflict here in the north. During the election campaign Fine Gael’s Fergus O’Dowd lost no opportunity to raise the hare of Gerry Adams’s membership/non-membership of the IRA during the Troubles. On his programme yesterday Vincent Browne mixed congratulations to the newly-elected Adams with comments on the killing of Jean McConville in the early 1970s. And on the same programme former Taoiseach Garret Fitzgerald, who with Thatcher devised the Anglo-Irish Agreement in the hope of reversing the Sinn Féin electoral tide of the 1980s, demanded Adams explain why Sinn Féin hadn’t made electoral progress in Dublin? When Adams hesitated (kind of understandably, since Sinn Féin was fresh from getting three candidates elected in Dublin) Fitzgerald told him ‘It’s not a trick question, I promise you’ and then went on to say he admired Adams’s skill, the way he’d moved his party from violence. I’m afraid this calls for one more metaphor: Mired In The Past. The Madmen chap who saw not businessmen but kamikaze pilots was stuck in a past that was fifteen years old. O’Dowd, Browne and Fitzgerald, for whatever reasons, saw not the president of a party that’s been sharing government in the north for five years, could well become the north’s largest political party in May, and on Friday last had some fifteen TDs elected to the Dail – they saw a psychopath with a bomb in one hand and an AK47 in the other, aching for a chance to get in some fresh mayhem. Cmon, guys. Adams is a POLITICIAN, one who on Friday got, what was it, the second-biggest voter-endorsement in the state. Criticise him for his policies, go ahead. Attack his attendance record, build a case for economic illiteracy if you have a neck that’s sufficiently brass. But enough of the increasingly wrinkled-and-bent references to events and a time when a lot of voters weren’t even born. What should we do about McGurk’s Bar and other British atrocities? I don’t see why we should forget the past when so many crimes against the innocent go unaddressed. I have sympathy with what you say, Anon. But I think Bloody Sunday has pretty conclusively shown that the British aren’t going to prosecute anyone for anything they’ve done. Agree with you there Jude. Sinn Féin has proven itself to be a radical alternative to the mainstream parties and has really done the work over the last few years. They outflank Labour on the left and are pulling the old Republican votes from FF. So it’s no surprise that these groups would decide to drag up incidents (some almost 40 years old) – in an attempt to damage them. I take your point about the Brits and Bloody Sunday. But is the outcome of your logic that we should abandon these demands altogether? I personally think David Cameron saying ‘Sorry’ was verging on outrageous and I was amazed at the jubilation that nationalists greeted it with. I shoot fourteen innocent people, thirty plus years later I say sorry, and everyone says how excellent I am? Except everyone opts into some sort of truth commission and feels there’s something to be gained from an admission of guilt – as distinct from being prosecuted for crimes – I don’t see a lot of point to it. The Brits will never go further than ‘Sorry’ and for me that’s a million miles from good enough. They were jubilant at the vindication of the murdered innocent. I don’t think it is possible for Cameron to be accused of having murdered 14 people. Heath certainly did and the responsibility lies with the British state. I doubt if opting into some truth commission would work. But relatives and society have the right to ask and not be pilloried for doing so. Prosecutions are not going to happen. But if we follow your position through we would find it difficult to get more truth about the murder of Pat Finucane. Yet there will be no prosecution there either. Anon – I would certainly defer to the wishes of those affected. I can’t for one moment imagine what pain they must have felt. I’m speaking from that outsider position, in logical terms. But of course life – and suffering – are larger than logic.